The end of summer, the beginning of a new year (school), and for some… a time when the time felt like it stopped and life changed. My heart and prayers go out to the many people affected by the wild fires, the floods and the other disasters and dangers. As I sit in my beautiful garden, it is difficult to begin to comprehend the devastation, losses, upheaval, transitions, changes, hassles and far reaching consequences. My initial thoughts went to the practical things like shelter and food. Then, after talking with people who were affected, I woke to the practical realities for people who organize and teach in health care worker and nursing programs, the associated practicums and the many students affected. 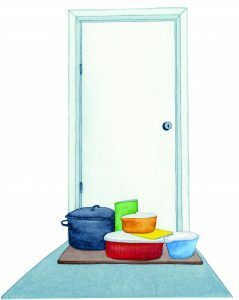 I thought of this image from the PSW text, that shows the practice of providing casseroles for people when they are grieving. I send my thoughts and hopes, and wish I was able to bring a nice warm casserole or a beautiful fresh salad to provide support! The spring and fall are usually busy with conferences and visits to schools and hospices. This fall we will be in Prince Edward Island, Canada, Ottawa, Ontario, California and Austin, Texas. We look forward to reconnecting with colleagues, and hope to visit some of the colleges as we go. Check the conference calendar – if we are in the same place, let’s connect and have a cuppa! The idea that death, dying and bereavement need to be addressed as a public health issue resonates strongly with me. The Public Health Palliative Care International Conference is in Ottawa this year. In addition to a strong focus on policy and community partnerships at the conference, the workshops will address ways to build compassionate communities and creative strategies for teaching the public. If these concepts are dear to your heart, I encourage you to consider this conference while it is in North America. For only a few more dollars, you can also attend the Canadian Hospice Palliative Care Association Conference! We are honoured by the positive feedback received about the nurse’s text, Essentials in Hospice and Palliative Care: A Practical Resource for Every Nurse. Our heartfelt appreciation to the nurses, nurse educators, students, and colleagues for their feedback and encouragement. Based on the feedback we collected, we have integrated some changes into the nurse’s text. If you have already purchased the text, contact us to obtain your copy of the Nurse’s Text Errata. Centennial College is the first community college to integrate the nurse’s text into their nursing program. We look forward to meeting with their students later in the fall to hear their feedback on the text. Are you a hospice aide? I am gearing up to present a series of webinars, specifically for hospice aides, with the National Hospice and Palliative Care Organization (NHPCO). In preparation for the webinars I am interviewing several hospice aides to hear about their experiences. If you would like to be interviewed, please email me. In closing, I will be sharing notes and insights from the conferences this Fall through Facebook. If you do not have to have a Facebook account you can still access these notes by clicking the above link or typing in: www.facebook.com/LifeAndDeathMatters/. Hoping to connect with many of you, renewing ties, and maybe grabbing a muffin and cuppa together along the way. This entry was posted in Hospice Palliative Care, Palliative Care Education and tagged public health. Bookmark the permalink.